What is so hilarious about it? I was dismayed by the tenor of the two articles on the Inter-Academy Report on genetically modified (GM) crops. Articles ‘Sham science’ (October 16-31, 2010) and ‘Scientifically invalid’ (January 16-31, 2011) attacked the scientists who wrote or supported the report. Invectives like juvenile, absurd, hilarious, trivial and amateurish were showered without giving reasons. Sentences have been taken out of context and commented upon. For example, the re is nothing absurd about the statement: “Chemi cally, however, all DNA are the same.” All DNA are made of same basic chemicals—base, sugar and phosphate. Functional differences between genes are the result of how the chemical units, the nucleotides, are strung together to form a polymer. Once ingested, the DNA breaks down into the chemical units. The first version of the inter-academy report contained a slip in relation to a chronological narrative. The slip was corrected in the updated report, which also includes citations to support the statements made. The drafts were widely circulated and an attempt made to reflect the majority opinion. Few dissenting notes with reasons were mentioned in the report and evidence provided to dispel the doubts. Technologies have associated risk. 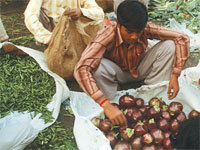 Much of the discussion in the articles was on Bt brinjal. Here again the report advises a guarded approach. It was also criticised because many of the scientists who wrote it and spoke in the meeting are part of GM crops regulation. Conflict of interest was implied. Who should write a scientific report of national importance—those who know the subject or laypersons? The objectionable descriptions in the report are not those of the reporter but views expressed by fellow members of the academies and well-known scientists who have been properly identified and quoted. One of the main critiques of the report—and the comments Ms Bamji has highlighted— also comes from one who was witness to the process, as the Down To Earth report makes amply clear. The fact that Inter-Academy Report was amended and issued with proper citations and references is a reflection on the process. Our reports do not go into the merits of GM crops and Bt brinjal. The cement factory by Nirma in Bhavnagar district of Gujarat has been in the news for quite some time but no satisfactory solution has been found (‘Water v industry: where is the question?’, February 1-15, 2011). The government with its unlimited power and authority and disposition towards favouring corporates, expects to break the resistance of farmers. All this is being done in the name of development but this model of development favours a few. The farmers stand to lose everything. The village grazing land is for cattle, not factories. A cement plant on a reservoir, that’s atrocious. Thank you for exposing the dictatorial policy of a democratic government interested only in serving the private sector. 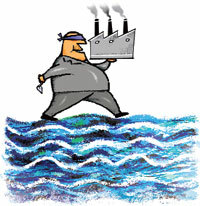 This is how India is losing its natural resources, while simple initiatives of a few are crushed. The editorial brings out important facts concerning common man. In India, things go in favour of the rich and the poor suffer. For our politicians, winning an election is supreme. However, in this case, I presume if the facts are properly brought to the notice of the Gujarat chief minister, he may mend things. The editorial highlights the negligence of the officials who carried out the environmental impact assessment (EIA) of the Nirma project. I think the EIA agencies just change the name and location of the projects while rest is a copypaste job from other reports. I have seen many such reports that are only fit to be dumped. The government should take action against such organisations that prepare incorrect reports. 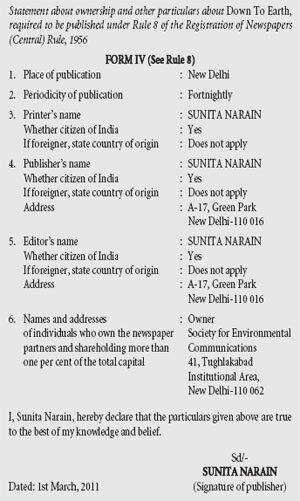 The agency that carried out the EIA for the Nirma project should be banned and legally prosecuted for hiding information. All governments in the world are pro-industry and anti-farmers. But in India this is even more glaring considering the fact that 65 per cent of the population is still living off the farms. In a country which has an agriculturebased economy farmers have been the biggest victims of government policies and natural calamities. A majority of farmers are small and thus cannot be insured under existing crop insurance schemes launched by Agriculture Insurance Company of India, the only authority to offer crop insurance. India’s crop insurance policies are practically beyond the reach of more than 80 per cent farmers and as such this insurance sector has proved to be a big failure. When government extends financial aid to farmers in the event of big calamities, most of that aid goes to financial institutions like banks. Measures taken by government to help the farmers are highly inadequate and misdirected, and such a big number of suicides prove them to be an absolute failure (‘Bitter harvest: farmers kill selves’, February 1-15, 2011). Congratulations to Lalitpur (‘Lalitpur’s baby formula’, February 1-15, 2011). But why do you call it a formula? Breastfeeding is such a simple cost-free method to keep a child healthy and happy. It is astounding how many mothers are misled by cow’s milk in a tin. Cow’s milk is for calves. Babies don’t have tails. Human babies need human milk. Do not let any propaganda about formula tell you otherwise. 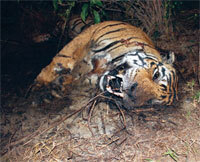 Nothing has changed since the Sariska fiasco in 2004 when poachers systematically killed all tigers (‘Endangered in Sariska’, December 1-15, 2010). We have not learnt anything from the past. Are our politicians really serious about saving the national animal or just wasting time and public money on innumerable meetings? The bureaucracy should expedite the release of funds for recruiting more field staff and use the latest technology for effective protection of wildlife. True that despite so many development schemes for the poor, benefits are still far from reaching them (‘Kind to cash’, February 1-15, 2011). This needs to be seen in two ways—mapping the people below poverty line (BPL) and benefit reaching them. The tag “poor” has become an opportunity for many to avail benefits even if they are not poor. This is due to inadequate measures used for mapping. These need to be made transparent to reach the target groups. As for reaching benefits to BPL citizens, the government spends too much (365 per cent). There are no words to justify this. Thus, the idea of moving toward the conditional cash transfer is better. The government should levy a recycling fee on all compact fluorescent lamps (CFLs) similar to the redemption fee many states charge on aluminium cans and plastic bottles (‘Light on mercury’,February 1-15, 2011). If a customer has a used CFL, he can exchange it for a new one without paying the extra fee. But if the customer does not have a spent bulb to exchange, then charge the person US $5 recycling fee and give him a gift card of equivalent amount that can only be used the next time he or she deposits a spent bulb. The onus of recycling CFLs should be more on the producer, and a good deal on the consumer. But these ideas are far ahead of the times we live in where the average literate person is yet to be convinced of his or her own environmental responsibility. The ecological cost of CFLs through mercury poisoning is far too higher compared to the savings it generates. Isn’t the CFL industry morally obliged to give back to society from which they are earning crores. Perhaps we the consumers could join hands in pressuring the manufacturers, which include big names like Philips and Bajaj, to include CFL recycling in their scheme of things. After all we are the market.